I love it when life circles you back to meaningful people. I met Mike Paskewicz nearly 30 years ago when I embarked on the Class of 2000 series for The Grand Rapids Press. We reconnected when I joined School News Network and started covering Northview Public Schools, where Mike was superintendent. He retires this month. Here is a bit of our shared journey. It’s near the end of a math lesson at Grand Rapids’ Burr Oak Elementary, and first-year teacher Mike Paskewicz is upset. He’s just gotten a pink slip from the principal informing him he has been laid off due to budget problems, and may not be called back to teach in the fall. Paskewicz chuckles as he tells me this story, 40 years later. It’s just one of several tales he tells of students he taught that year, and he remembers all their names. He also remembers their stories, like the girl who had bruises on the back of her legs until he called the authorities on her parents. I marvel at the clarity of his memories, yet I am not surprised. 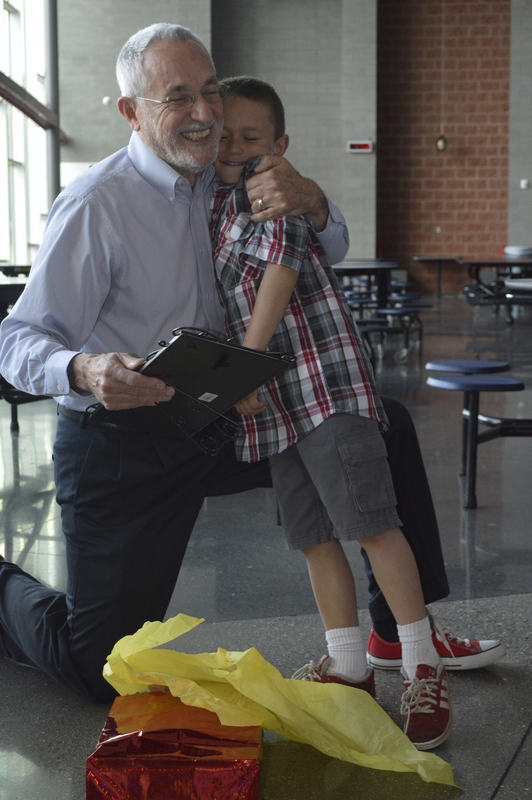 In the nearly 30 years I’ve known Mike Paskewicz, the superintendent of Northview Public Schools, I’ve seen how much Mike loves students – I can only call him Mike after all these years — and the chance to make a difference in their lives. It is no different now, as he prepares to retire at the end of this month. He still fills his days working on students’ behalf, whether it’s reading story books to them or telling legislators to give them more support. But this time, he really won’t be back in the fall. Forty years after stepping into that fifth-grade classroom in 1975, he’s amazed how quickly it has all gone by. He will be deeply missed in the 3,400-student district he’s led since 2009. When the school board hired Scott Korpak to succeed him, the incoming superintendent acknowledged the “sense of loss” the Northview community will feel. At an open house in late May, people waited in a Disney World-length line to say goodbye. That’s one reason Mike has been an educator’s educator. He gets in there every week with students like Travis VanSetters, his witty “life coach” at North Oakview Elementary School, who inspired him to wear red tennis shoes as a reminder of his daily responsibility to students. But Mike also gets into it with legislators, firing off emails that challenge them to correct funding inequities. He gets into writing his blog about his weekly visits to elementary schools. And he gets into huge reams of data to guide better teaching strategies. His rare gift of enhancing education at the meta-level, while being able to joke with students and staff in the hallways, has served him very well at Northview, and at the three other school districts he has led. One example: At the 40,000-student Adams 12 Five Star Schools district in Colorado, he supported a project to help young Hispanic students learn to write. They published a book of stories that found its way into the hands of Bill and Hillary Clinton, among others, and earned 11 of them $2,000 college scholarships. If you want more examples, I can send you his resume. I too will miss him, not just as an exemplary educator, but as a friend. I met Mike in the fall of 1987, when he was principal of Fountain Elementary School in Grand Rapids. I was a reporter for The Grand Rapids Press, and asked him if I could do a series of stories on Fountain’s kindergarteners. I wanted to explore the educational and personal experiences of students scheduled to graduate in the year 2000. He readily agreed. Thus was born the Class of 2000 series in The Press, which would continue every year until those students graduated – well, two-thirds of them, anyway. From the outset, I was impressed with how much Mike cared about those students, and how candid he was about both their talents and their hardships. “Maybe that is where I found my voice for the value of public education,” he told me recently. “People need to know everything that goes on – not just the positive, and not just the negative. Mike helped me tell that story about his students at Fountain, who came from a mix of middle-class and low-income families. He once told me about a boy who, after learning his mother was arrested for prostitution, took his younger brother and sister through a cemetery to their aunt’s house. The next day he took a test, and did well. But with a stable family, Mike asked, how much better would he do? “Kids can be successful regardless of the at-risk factors at play in their lives,” he added, firmly. Our winding career paths brought us back together two years ago, when I began covering Northview for School News Network. As ever, Mike has shared with me the hard realities of students’ lives, but also the delightful fruits of their growing minds. 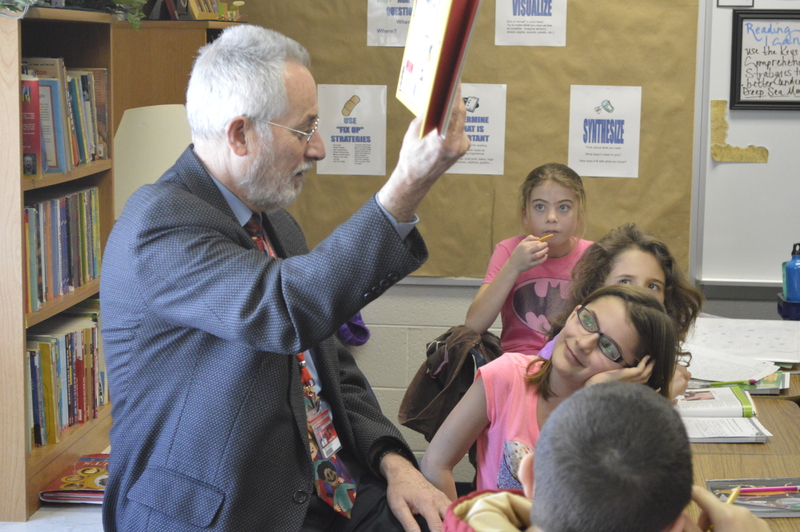 Earlier this spring, he visited two particularly delightful children – his granddaughters Zoe and Ava, students at Kenowa Hills’ Zinser Elementary School, where Zoe invited him to read stories to their classes. 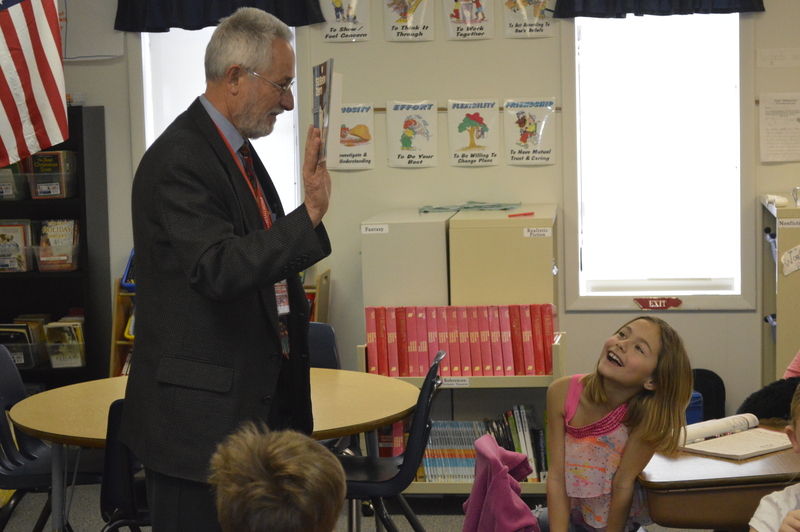 He wore a cheerful-faces tie he had been given at Fountain, and talked eagerly with students about his favorite books (“Old Yeller”) and theirs. Boy, did they. For more than two hours people lined up to say goodbye to him, his wife, Ruth, and their children, Josh and Jade. Longtime Rockford Superintendent Michael Shibler was among the well-wishers. Knowing Mike, I wouldn’t be surprised if he did just that.